Dadirri is the duo of veteran American home taper Ken Clinger and Australian musician Vis Ortis (aka Skt Stklr). My acquaintance with Skt goes back to the early Aural Innovations days and albums by his band Vocabularinist and its multiple offshoots, and, more currently, his Squeegeed Clean and Mekigah projects. 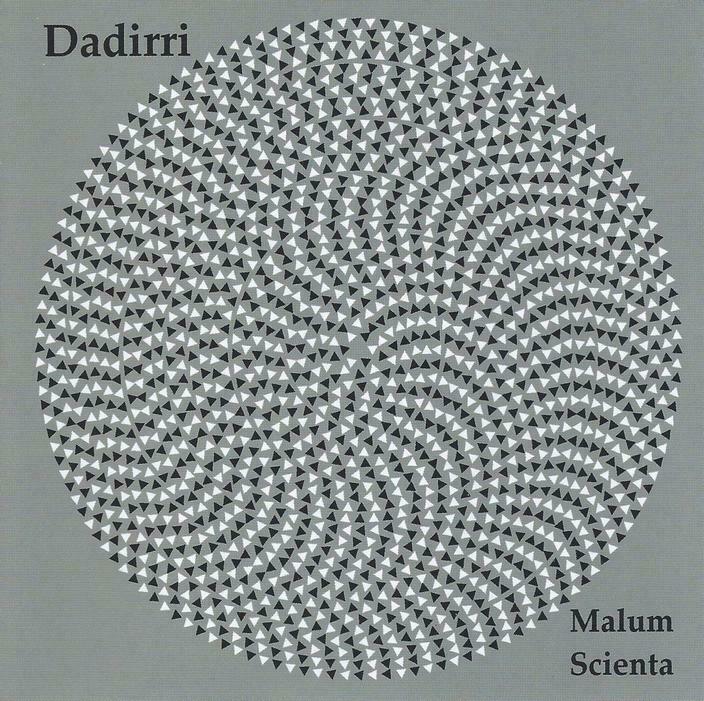 Malum Scienta is the second Dadirri album, the follow up to the previous year’s Electrified Space Bacterium. While most of the music on Electrified Space Bacterium was in the 3-6 minute range, tracks on Malum Scienta commonly stretch out to 8-12 minutes. But individual tracks and lengths are of little consequence on this album, which plays like a continually evolving, deeply psychedelic space excursion and adventure in sound. Right out of the chute the music is hallucinatory and disorienting, like a lysergic lucid dream state, with multiple looped and swirling effects anchored by lulling melodic harp. We’re treated to valium drenched carnival scenes that blend whimsical melodies, soundscapes and effects. There’s rushing, howling and weaving space-scapes. We’ve got floating space electronica with an industrial edge, supported by a gently grooving rhythmic pulse and a pleasant melody. Volatile Particle Conference is a little different, laying down a Reggae rhythm with a trippy melody grooving along, surrounded by a parade of soundscapes, roaring waves of sound, revving engines and ethereal voices. And Genetic Legend Mapping is the most purely musical and meditative track of the set, though it’s also just as dreamily mystifying as the rest of the album. Dadirri take ambience and floating electronica and propels it into a world of phantasmic psychedelia. Think Fantasia meets The Trip with soundtrack by The Residents. There is so much happening at any given time, so many elements contrasting and converging, that while the music is, at its core, ambient-soundscape, the psychedelic elements keep the imagination continually in overdrive, like an acid trip that is constantly alternating between delirium and off balance dream land. In short, this is one of the most challenging, and often gripping space-ambient-psychedelic releases I’ve heard this year.